Meet Two Tough Nuts. If a crook jumps bail, it's up to Hardball and Gomez to find him. They'll always get to their man - if they don't get to each other first. IF THEY COULD JUST STAND EACH OTHER, NO-ONE ELSE WOULD STAND A CHANCE! Good luck finding this on video! Originally made for television and released in 1989 by New World International. 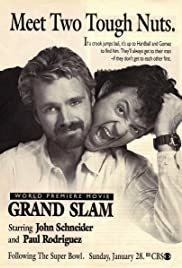 The action adventure comedy - "Grand Slam" was released in Australia under the title of 'DEAD TROUBLE'. It stars John Schneider and Paul Rodriguez as HARDBALL & GOMEZ. It was distributed in Australia by PREMIERE - A division of VILLAGE ROADSHOW CORPORATION LIMITED. (1989) To my knowledge, it has never been officially released on VHS or DVD in Australia, and could possibly only be found at your local secondhand video dealer as a EX-RENTAL...if your lucky! I paid $2.95 Australian for mine! Yep, you guessed it! "They back and up to their necks in it again in MORE DEAD TROUBLE"
I never even new it existed until today, as I found it while looking through the secondhand bins at my local video store. "United they stand. Divided they fall for every trick in the book!" John Schneider (The Dukes of Hazard) and Paul Rodriguez (The Whoopi Boys) are reunited as HARDBALL and GOMEZ. Written and Directed by Bill Norton. Running Time 89 Min's: Released by Roadshow Entertainment in Australia.